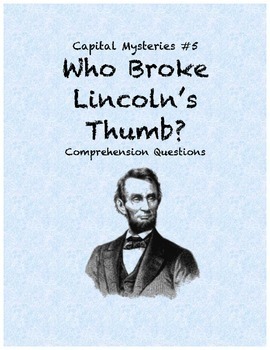 Capital Mysteries #5 Who Broke Lincoln's Thumb? 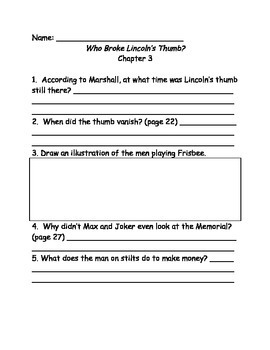 This packet is a set of comprehension questions for the book Capital Mysteries #5 Who Broke Lincoln's Thumb? There are questions for each chapter. It is a good way to for the students to practice answering in complete sentences and going back in the story to find the answer. 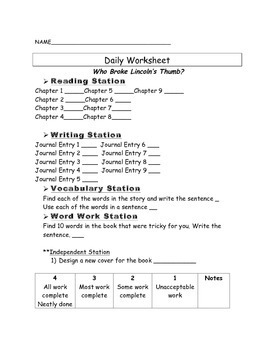 I have also included journal prompts for each chapter as well as a daily worksheet (with a rubric) for the students to keep track of their progress while reading the book. I have used this for my higher level second grade students. It has been used during guided reading as well as for independent work.